Our friend Cooper needs our prayers. He has a condition that causes his bone marrow to make too many red blood cells which can cause seizures, hemorrhages, blood clots to to the brain, tumors and death. On Wednesday the vet told his Mom that his HCT level rose five points in two days which was very scary. Also she could not get the medicine he needed because it was not available yet. He told her to watch Cooper to make sure he was not showing any signs of needing a blood draw but never told her what those signs were. His poor Mom didn’t know what to do or which way to turn. On Thursday Cooper and his Mom spent six hours at the vets. They took his blood which doesn’t seem nice and didn’t replace it with fluids for a long time leaving our friend a little loopy and tired. He has to go back a week from Monday for a CBC. While there they had to suffer through what always happens when you spend too long at the vet, they came in contact with someone who was putting down their pet, a six year old Great Dane with cancer, and they all sat together and cried at the loss of this magnificent lost. So, again, a good dog, is unfairly suffering through no fault of anyone. Another dog, another senseless illness. Sometimes humans say it’s a dogs life, and having lived one for more than 11 years, I can attest that a dog’s life is a pretty darn good one. But sometimes it’s just not fair, and what has happened to Cooper, getting healthy only to find out he is sicker than he ever thought, well that’s just about the most unfair thing I can think. So I am asking what I know I never need to ask. I am asking for prayers and positive thoughts to go out to Cooper and his Mom. I’m asking for this cold and cruel world that we live in to be a little less cold and cruel. I am asking for a miracle. We’ve done it before. Let’s say our prayers and get another miracle so a year from now we can celebrate Cooper as Pup of the Week because he did something wonderful and becoming ill, because Cooper is a super Pup, and certainly worth using a miracle on. 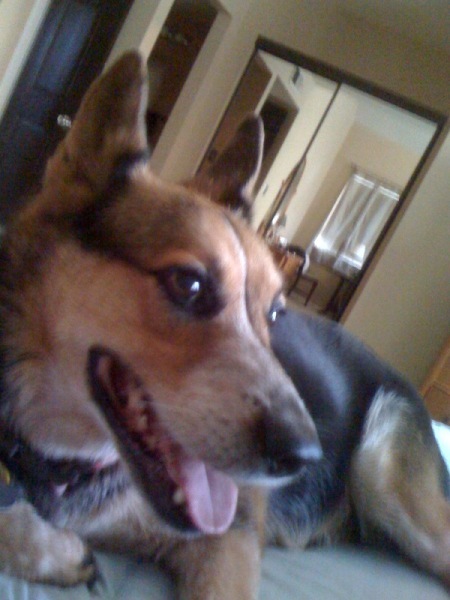 The last time our Pup of the Week, Scooter, was so honored, it was in September 2010. It was a dark days for us dogs. We had recently lost some of our friends to the Bridge and when Scooter’s groomer spotted red marks on his mouth and tummy the vet put forth two courses of action: One, he would be fine, the other would be another pup lost to the bridge. The diagnosis was IMHA. He needed a transfusion and lots of expensive treatments. But Scooter is a champ and he pulled through, fighting off long odds, helped by his Mom’s love. Thirteen months later (an unlucky number) in the six days before the dead walk the Earth (also unlucky) Scooter got some unlucky news. He has a condition that causes his bone marrow to make too many red blood cells which can cause seizures, hemorrhages, blood clots to to the brain, tumors and death. Even sadder, Cooper was about to come off the medication for IMHA. After a year of fighting off one illness and beating it, and maxing out his Mom’s credit card, he got hit with this new disease. It was like travelling to the end of the yellow brick road only to find a dragon threatening your life. On Wednesday the vet told his Mom that his HCT level rose five points in two days which was very scary. Also she could not get the medicine he needed because it was not available yet. He told her to watch Scooter to make sure he was not showing any signs of needing a blood draw but never told her what those signs were. His poor Mom didn’t know what to do or which way to turn. On Thursday Scooter and his Mom spent six hours at the vets. They took his blood which doesn’t seem nice and didn’t replace it with fluids for a long time leaving our friend a little loopy and tired. He has to go back a week from Monday for a CBC. While there they had to suffer through what always happens when you spend too long at the vet, they came in contact with someone who was putting down their pet, a six year old Great Dane with cancer, and they all sat together and cried at the loss of this magnificent lost. So, again, a good dog, is unfairly suffering through no fault of anyone. Another dog, another senseless illness. Sometimes humans say it’s a dogs life, and having lived one for more than 11 years, I can attest that a dog’s life is a pretty darn good one. But sometimes it’s just not fair, and what has happened to Scooter, getting healthy only to find out he is sicker than he ever thought, well that’s just about the most unfair thing I can think. So I am asking what I know I never need to ask. I am asking for prayers and positive thoughts to go out to Scooter and his Mom. I’m asking for this cold and cruel world that we live in to be a little less cold and cruel. I am asking for a miracle. We’ve done it before. 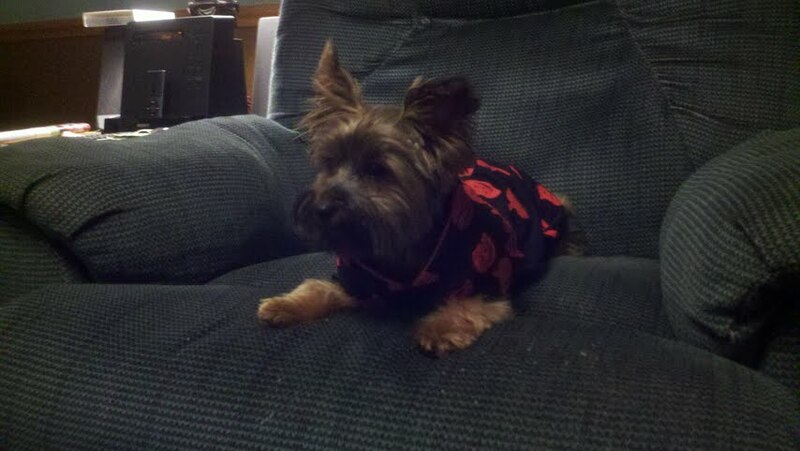 Let’s say our prayers and get another miracle so a year from now we can celebrate Scooter as Pup of the Week because he did something wonderful and becoming ill, because Scooter is a super Pup, and certainly worth using a miracle on. In between our modular home and the one to our left is Mommy’s gardens. On the edge of the gardens is a black dual bird feeder holder, one very big, one very small. Next to the feeders are two thin fern trees where thousands of birds live. There are Blue Jays, Robins, Sparrows, all different types of pretty birds. Foley ignores the birds like she ignores most things but I’ve become friends with them. I have reached an agreement with them. They talk to the big birds for us so they don’t swoop down and carry us off. And I chase off any vermin that comes near them to steal the food. When Daddy just takes us out to pee I usually hang out at the feeder and discuss the news of the day. One day, late in August, a pretty red bird was eating some of the seed that fell to the ground. I wandered over, pretending to smell for a proper pee spot, because neither Daddy or Foley liked me talking to the birds, and found a pretty red bird. I asked him what kind of bird he was and he said he was a Cardinal. I told them I had heard of them while watching baseball with Daddy. He asked if Daddy was the one who had put out all this delicious food out for them and I said yes. He then said the birds wanted to thank Daddy. He told me to have Daddy put all his money on the Cardinals winning the World Series. I shook my head and told him Daddy said the Red Sox were going to win the World Series. The bird told me that wasn’t going to happen because their pitching staff did nothing but drink beer, eat chicken, and play video games. I aarfed. Like that was possible. But the cardinal told me he knew it was true and he was going to prove it to me. He was going to drop a Cardinals cap on the driveway for me. He then flew away. Just before the beginning of September I saw that cardinal again. I asked him about the cap and he said he dropped it and an old man picked it up and brought it in his house. There were plenty of old men here in the Village of the Pruned but he said not here, a couple of miles way from here. This was unfortunate because I needed the cap to prove to my Daddy that the Cardinals were going to go to win the World Series. Then, that night, he told Mommy that his Daddy had found the Cardinals caps in his own driveway. I jumped up in his lap and told him he had to go get it right away, that it was the Cardinals rally cap. Daddy told me I was being a silly girl and put me on the floor. But starting that night the Red Sox kept losing, and the Cardinals kept winning, and Daddy began to believe in the bird brains. Without telling Mommy he bet the modular home on the Cardinals.. 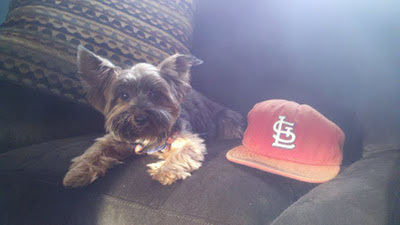 He decided, to insure the Cardinals winning, he needed the cap. But his Daddy, having thought that a Cardinals cap falling from the sky into his driveway was a sign from the baseball Gods, had bet his house with the same bookie Daddy did on the Cardinals winning, and believed if he did not keep the cap the Cardinals would lose. When the Cardinals fell behind 3-2 Daddy panicked and decided that it would be better luck if I, the intended recipient of the cap, had it, so he stole the cap from his elderly Daddy. His Daddy chased him for half a mile but with bad legs and a bad back he fell behind. So we are waiting for the game. The Cardinals better win. Foley has downloaded herself to St. Louis. 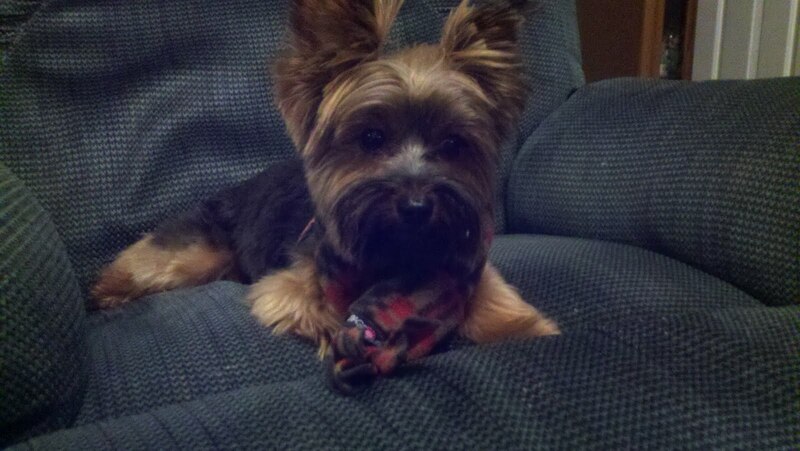 They may have caught the rally squirrel but they will never catch the Rally Yorkie! Then again Daddy and his Daddy bet their houses with the 92 year old man who rides around on his bike and rings his bell all day and Foley and I are pretty sure he’s insane so we’re not worried about the houses. But to prove how devoted we are here is me with the Cardinal Rally Cap. Go Cards, because we don’t want our Daddy and his Daddy being chased around the Village of the Pruned by an old bookie on a bike ringing his bell while being nipped at by a Rally Yorkie. I felt a crushing sadness when I learned of Snickers going to the Bridge, perhaps because of the culmination of passages to the Bridge since the fall of summer, perhaps because I so enjoyed our conversations, perhaps because, as his Mom said to me on Monday, he was her best friend, and perhaps because I don't think many of you got to know the pleasure of his friendship as much as I did. Snicker had quite a long life for a dog, had a wonderful Mom, a wonderful family, but whether it be a two year old, or a 15 year old, the passing of a dog, bar the passing of a child, is so incredibly emotionally taxing on our Moms. 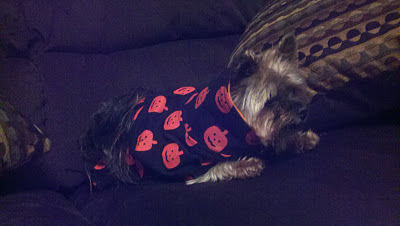 Snicker had a very hard last year. We both had the same attitude about the grandbabies who came to visit us. 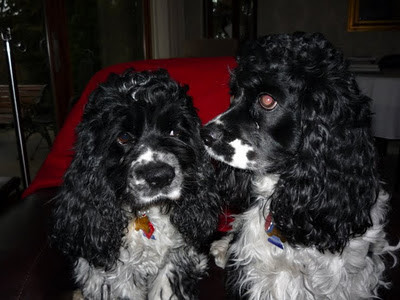 We loved them, but gosh, they are a bother, wanting to pick us up, chase us, just love the literal stuffing right out of us. I had Pocket and her eternal cuteness to throw at them while I scurried under the bed, but Snicker's had only his own eternal cuteness to offer. Snicker and his Mom always knew how to enjoy themselves. At Christmas his Mommy sat on the floor to wrap gifts. She would spread the paper on the floor and Snicker would sit in the middle of it. She would chase him off and they would play chase throughout the house. It was one of his favorite games, and, if the truth be told, hers too. The temperature was always a problem for my little friend. The cold of the winter bothered our him a great deal. He got the trembles a lot from the cold. His Mom put a sweater on him and even talked about pants. But Pocket had patented pants so he couldn't wear them. But when it warmed up he enjoyed his walks at Riparian Preserve where he got to play with the ducks and his other bird friends. He made it a rule only to chase the cats. And he could go to the park when it was just him and his Mom and he could run fast and free like he was young. He still had fun, even with a stubborn stomach bug he couldn't shake. By the end of January Snicker could no longer go on long walks. He still went to visit his bird friends, and he still chased a cat or two, but his allergies were keeping him from enjoying the outdoors as he did before. And the vet gave him some icky medicine to take. Do they ever have good medicine? And then there was the snorting. Not the Lindsay Lohan kind but the kind I get where I snort and don't breathe well. I do it once or twice a month but for Snicker it was an everyday bugaboo. If you don't snort you don't know how bad it is. 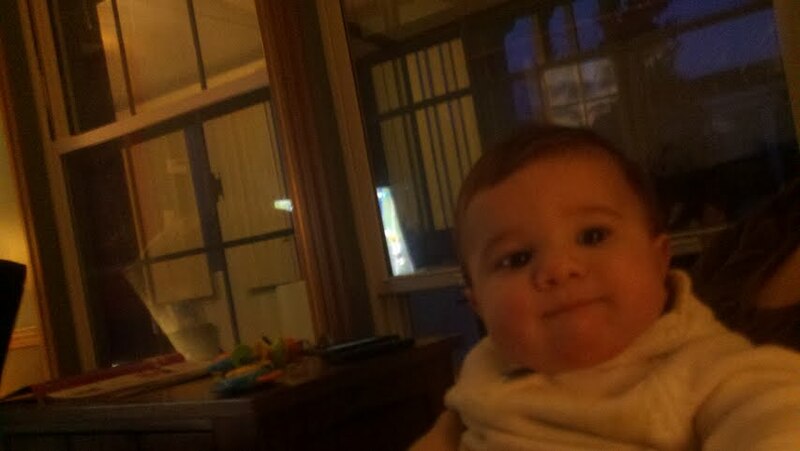 You have trouble breathing, Mommy and Daddy get excited, Pocket snaps at me because she's confused. Mommy picks me up and I settle down in a minute or two. But a big gust of wind in the face can set it off. So Snicker and I were siblings in snort. A week after Pocket and I moved into our new home Snicker moved into his. And just like me he was happy to find no stairs. Oh stairs are such a pain when you reach double digits. Cesar Milan says your parents should take you for a three hour walk when you move into a new home. Neither of our Mommies did that. No ones Mommy does that. And yet humans still listen to Cesar. There were a few problems for Snicker in the new house. He would see vermin in the yard and dash straight into the glass door a couple of time. It hurt quite a bit but Mommy was there with sweet kisses. Snicker did enjoy his walks but the heat kept getting to him. He had to stop and cool down every time they hit a shady spot. His parents tried to keep him out until he did his business. I can tell you from my experience parents don't like when you leave treasures in their new house. His Mom tried to schedule his walk for early in the morning or late at night but the Arizona heat was unrelenting this past summer. His Mom began to put ice cubes in his water to cool him off during his walks. The temperature continued to climb up to 110 as his mother thought about getting him his own pool but he wasn't crazy about the idea of stepping in water. Snicker was having a difficult time breathing in the heat. His parents decided to roll up the rugs and let him stay in the cool house. He did find one advantage to the onset of deafness. He was able to watch the fireworks without having the big bangs going off. By mid July it seemed the weather had painted a bullseye on our little friend. A thunder and lightning storm rocked his house so hard his Mom lay in bed with him all night as he moved restlessly to and fro on the bed and tried to catch his breath. Then came the huge dust storm that covered everything and left dust in the air. Not a good scenario for an elder dog with serious breathing problems. Snicker would only go out to do his business. When he came back in her got a nice cool face wash that cooled him down and removed the dust that had collected from the air. By the end of July nature had almost defeated Snicker. He got so hot his Mommy and sister tried ice bags to cool him down and then finally put him in an ice bath that may have saved his life. Blazer reminded his Mom that this could have sent him into shock but the alternative could have been a much easier trip to the bridge. Regardless his Mom decided it was his last ice bath. I did not hear from Snicker after that. Then in the beginning of October he had his first stroke. His Mom knew she had a hard decision to make. He had a second stoke on the 14th, and on the 16th it was clear he would not be Snicker anymore. After his Mom held him in her arms for four hours while he slept she made the decision, took him to the vets, and the vet aided our friend on his trip to the Bridge. Our friend Tanner at the Bridge let us know that Snicker had arrived, and our hearts sunk, and broke on the floor. The next day we learned Snicker sent us one last message, in his last days, in the form of a Warren Zevon song, which we will print for you below. He told me to make sure his Mom knew the message was for her. 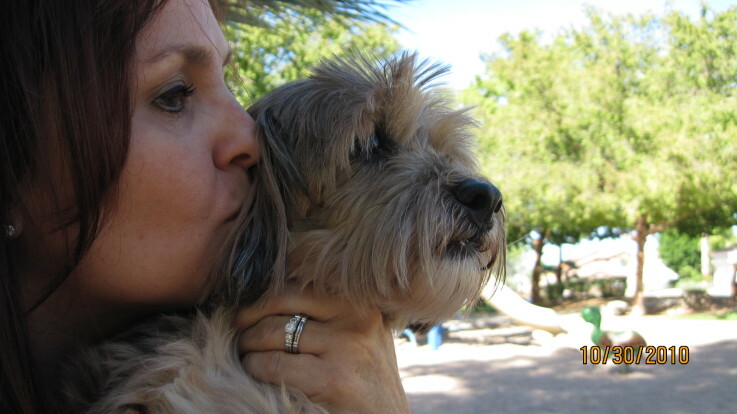 Before we do let me make clear, Snicker was a great companion to his Mom, a great friend to all, and we miss him like a brother. When we go out for our last walk to the night we look at the stars, and we have noticed Snicker's star shining brightly in the west. And we blow a kiss and tell him how much we love and miss him. So here's to Snicker, I hope you knew him, your life would be sweeter if you did. I am a 14 month old male dog. Despite having an older brother to show me I still pee like a girl, by squatting. I didn't think it was any big deal. But then my Mom goes and puts it in a blog. Now everyone knows I'm a premature squatter, I'm an underdeveloped leg lifter. Am I failing in my duties as a big male of our species? And should I be mad at Mommy for spilling my squatting? Your Mom is just worried about you. You know how Moms want us to be perfect and happy and never have a thing wrong. All our Moms assured her that there was nothing wrong with squatting. Some boys even admitted to squatting themselves. So you don't have anything to worry about. Just don't let your brother Benjamin tell any of his law enforcement buddies because if they find out you're a squatter they'll go Andy Sipiowicz all over you. I recently learned of a dog named Kelly that went to the bridge. My Mom contacted this poor dog's mother and found out that she had no money to pay for the operation that Kelly did not recover from. Me and my Mom wrote a blog on DS asking people to send money either to the vet or to the family. Then my Mom got a phone call. Someone told her that Kelly was alive and well. Her Mom posted everything as a way to get money. As soon as this became public knowledge the profile was taken down. Mommy is not only upset she sent in money but she got other people to give money too. Luckily lots of people sent money to the vet and he is reimbursing them. Why do humans have to come on dog sites and try to scam good humans like my Mom out of money? As we know humans get very desperate when it comes to money, and some are real ditches. And they know our parents are suckers for every sick dog story. My suggestion to all dog Moms with big hearts, (which is pretty much all dog Moms) is, before giving money, have the person in need provide the name of the veternarrian so you can verify their information. That's what humans should do. As for us dogs, first I had Daddy take me to the State Mental Hospital across the street from where our house used to be. I gathered up the geese and told them what the woman had done. They are headed west. It will take them awhile to arrive but they are planning the largest poop on you award ever. Then we cornered a squirrel, spared its life, and sent him west to pass on the word. Soon that woman's entire yard will be one large gopher home. Also, while I talked with the geese at the hospital Pocket talked with some of the crazies and they are also headed west to give the woman the full Ghadaffi. A beating, a shooting, strapping to the hood of a car and parade. I'll think of what to do the week after. Its Halloween and my Mom is not very good at making costumes, but she is very good at making treats. She wants to wrap me in some strange cookie, paint me orange, and have me pose as a Snausage with "eat me" scribbled on my side. Has she lost her mind? I think you be adorable in a little eat me outfit. You could be a Kolausage. Of course you should not go out trick or treating. The last thing you want is a hungry Golden Retriever performing a Chuckles the Clown on you. My Daddy enrolled me in something called K9 Kamp. I think he was trying to kill me. I did not lose any weight, did not need to lose any weight, and all I got out of it was gravel in my ear. Is there anyway we can file suit against him? Oh Pocket that was not a plan of Daddy's to kill you. That was a plan of Mommy and her friends to kill him without their being any blowback on Mommy. It almost worked. If you had zigged instead of zagged he's be pushing up dasies now. But you did a great job. Better luck next year. We don't see much of our great big American Bulldog cousin Mia, She used to come visit us at the condo but she has never been to our new house. She used to go for rides all the time with our human brother Chad. We didn't go to her house too much. Chad and his wife Lisa don't like Mia jumping on their couch because she sheds. Pocket and I don't abide by the rules so much. So we don't go over there; it has something to do with if Mia can't jump on the couch than neither can we. Lisa then had her human litter of one. A cute little buy named Calvin who we love very much. But like lots of first time parents Lisa and Chad were protective of their precious new life. And Mia, who had gone from being the baby to being the baby watcher no longer knew where she fit in the family. Mia wanted to check out this new little life. But her parents were always pulling her away when she got close. And the attention she got Well now that was going to Calvin. Slowly, as Calvin got to be a meaty 19 pounds, and Mia got to know the little man. As his parents grew more comfortable and their confidence as parents grew they allowed Mia to get close to Calvin. Mia wasn't sure what this thing was but she knew her Mommy loved it and that was enough for her. So Mia made up her mind that from this day forward she was going to be Calvin's protector. But there was no test to show how protective she had become. All the people who came to visit Calvin Mia knew before Calvin came and she trusted all of them. She would bark at strange noises in the night and vermin in the back yard. Her parents told her to be quiet but she was fulfilling her new job, protecting that perfect baby. Mia heard over the phone that there was going to be a family picture taken. She wistfully thought back to the days when they would mention a family picture and that would mean she would be brought along. 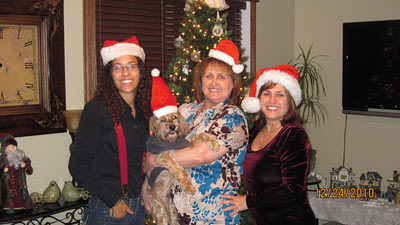 But she had accepted that a family picture now meant her parents and the baby and she was good with that. She just didn't know what would happen with that baby without her to protect him. The day of the picture taking came and there was much time spent on getting Calvin to look perfect. Mia planned the walk to the door toe see them off. But when she got there here Mommy reached down and snapped the leash on to her collar and Mia to was led out to the carl She was going to be in the picture, a part of the family just like the other four. Mia and Calvin sat in the back seat. Mia made sure to stay seated. She didn't want to have the car careen around and her fall on to the car seat. So she was very careful to stay still and not tip. They reached the park where they were going to get the photo taken. Calvin was taken out of the seat and sat up between Mom and Dad. A very proud Mia lay down on the grass next to Mom. The photographer got set up to take the picture. But the photographer was not happy with Calvin's smile. So, to get him to smile, the photographer went up to Calvin and with a strange look on his face said. "I'm gonna get you." 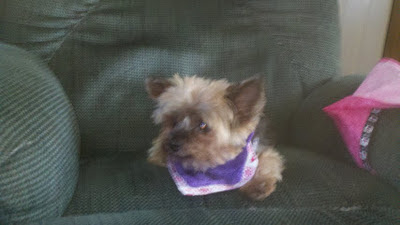 Mia jumped up, snarling and barking at the man who was threatening the little baby she had sworn to protect. He ran a few steps backwards. Mia realized that the man wasn't threatening Calvin but trying to make him smile. She was afraid she was going to get in trouble but her parents, knowing she was protecting their baby told her she was a good girl and then Mia realized what a valued member of the family she was. She sat down again on the grass with a big smile on her face. A most valued member of the family. 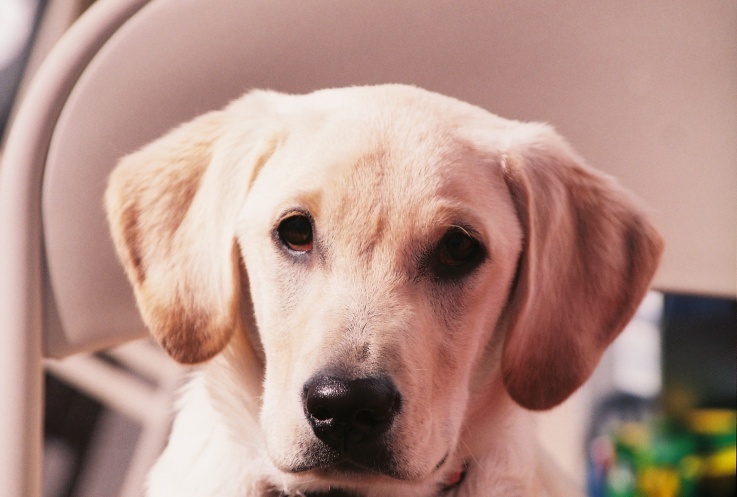 This week, after we had collectively suffered through tragic deaths of close friends I put on my editor's hat and tasked Pocket Dog Private Dog with finding a happy story for this weeks pup of the week. Pocket sniffed all around the Brigade's playground. She turned over rocks. She sniffed every tree. But there was nary a good story to be told. Then, during one of my late night trolls through the blogs I found it. Among the stories that had caused of sadness was one concerning Shadow's Mom. She had a lot of back pain, and she had a kitty scan, and they spotted something on her liver. A spot on your liver, like a spot of liver on your plate is never a good thing. Shadow asked the Brigade to pray for his Mom and we all did. It did seem that lately everything was going poorly. So while we prayed for Shadow's Mom we had come to expect the worst. But on Monday the good news arrived. The spot on the liver was nothing to be concerned about. Shadow's Mom was not going to need saving operations and life altering treatments. Oh Shadow we can't tell you how much your Mom's good report meant to us. We have lost two Moms in the last two years and we don't want that to happen again. And Shadow you are so sweet we don't want you to have a moment of sadness. It did not make up for those we had lost but it gave us a brief respite from the pain. And we owe Shadow, is Mom and the good doctor for that. Shadow's Mom, while not facing an uncertain future health wise, still had a ways to go before she is one hundred percent. She has a large cyst on the base of her spine. This is what is causing her so much pain. She has been put on medication to help shrink the cyst. Every night Shadow has to wrap her medicine in bacon and feed it to her. Then the doctor is going to take a large needle and break apart thee cyst. My Mommy has had lots of shots in the back for her back pain, which she said she got from raising two Yorkshire Terriorists. Unless Shadow has a Terrier sister I don't think Shadow's Mom shares the same pain with our Mom. But the good news for Shadow is that when Mommy gets her shots in the back she has to take a lot of pills beforehand, and when she gets home she's loopy as heck. Hopefully Shadow's Mommy has someone like Daddy who can place her in a recliner with a blanket where she can recuperate the entire day and provide a lovely lap for Shadow. There is a possibility that Shadow's Mom is going to need surgery to remove the cyst and none of us want that. So remember to ask the Bridge Angels to watch over her and help dissolved this nasty cyst. Because when we make someone as sweet as Shadow Pup of the Week we only want to do it because she's happy, and nothing makes her happier than a healthy Mom. So let's raise a Foleytini or two to Sweet Shadow, our Pup of the Week. Pocket and I like to complain about things but we are the two luckiest Yorkies in the world. We have the best friends anyone could ask for, and we have our parents tied around our little dew claws. To give you an example of how we have our parents under control I will relate this story. At our condo across from the state mental hospital there was a back door with windows that went almost to the floor so I could stand and bark at anything that moved in the back yard. But since we moved to the Village of the Pruned we don't have floor to ceiling windows and I can't help in the neighborhood watch. This morning Daddy saw a squirrel by his bird feeders. It is my job to keep the vermin away from the feeders. It had been raining and the ground was wet. I guess Daddy didn't want me to get my paws wet, he had just brought me out and dried my paws when I came in. So he picked me up from my comfortable chair, carried me out on the porch, opened a porch window, pointed out the vermin, held me while I barked, then, when my job was completed, carried me back and put me on my chair like the princess I am. I don't even have to chase vermin anymore. I get carried, then held, to bark at them. I am the Queen. On Thursday a frustrating thing happened. The door opened and shut but no one came in. I find this behavior very annoying. 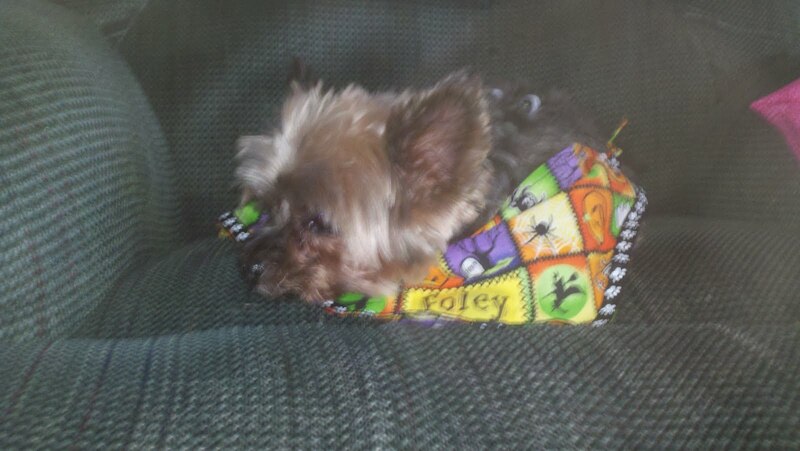 In the world of Yorkies, either you're in or you're out. Pocket and I stood by the freshly painted closet door and barked our protest. Mommy went out and came back in with a box. We got very excited because boxes usually means gifts for Yorkies but, at first, Mommy said they were new sandals for Daddy's precious little feat. Big deal. But then she said, no, she was wrong, it was for us. We hurried over to the table to wait and see what we got. Of course Mommy and Daddy had to study the package. They couldn't' find a sender's name anywhere. Pocket and I were making our "miiir, mirrrrrrrr, miirrrrrrrrrm" whiny sound of impatience. They slit open the box. The first gifts to come out were these wonderfully stylish scarves. Pocket took to hers like a duck to water. I took to mine like a duck to a shotgun. I don't like having things pulled over my head. I have seen the Green Mile one too many time. I did take to the delicious dental bones that came in the package. When Mommy's and Daddy's therapist came over on Thursday morning I scoffed mine down faster than any Yorkie could. 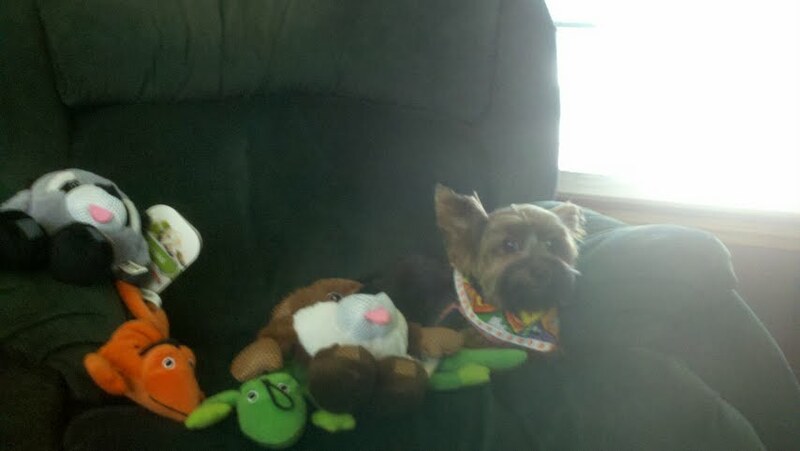 Pocket, wearing the scarf, and the shirt Reba, Logan and Dodger sent her was too nervous to eat. The therapist. 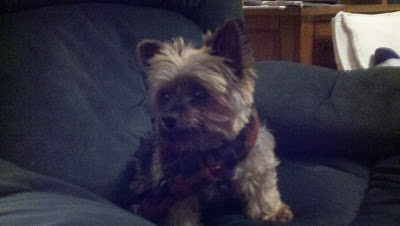 seeing a Yorkie dressed in scarf, shirt, and pants, raised her deductible. Also in the package were two Halloween costumes. Pocket dove into hers. I remained aloof about mine. But I decided to be a good sport and try it on. The pictures are below. But until Pocket cracks the case we want to thank all the wonderful friends we have on TB, DS, and in the blogger community. I thank you all for being our friends and making us the luckiest dogs in the world. Oh man, I think I should have jumped over something bigger than a dime at K9 Kamp. It seems I might be too wide for my own good. Mommy is still painting the doors of our modular home. You would not believe how many doors there are in this place. They could shoot "Let's Make a Deal" here. This is the first experience I have had with Mommy painting. Every four or five years Mommy paints. Foley has been through it before. Usually she likes to see me stumble into trouble. But she knew how much trouble there would be if I caused a paint spill so she told me what ever room Mommy is working in stay out of it. Before I continue with my story let me point out that I am only six inches tall. That leaves a lot of door to be painted that can not get on my fur. I mean why even paint the bottom six inches of a door? What human sees it? They never look below the knob anyway. I have consulted with Foley, and while she agrees that it was entrapment, she won't take on Mom. Mommy was painting the closet door by the kitchen door while Daddy was out. First of all when ever anyone comes in the house I am right at the door crack waiting to see who it is. If it is Mommy or Daddy then I stand on my back legs in excitement. But I don't have great balance on my back legs. I am not Nancy Grace for heaven's sake. So this is what happened: Mommy had painted the closet door while Daddy was shopping. I did not go near her. Then she moved on to the laundry room door. Foley and I were sitting in the living room, just chilling, when I heard the car door shut. I knew it was Daddy and I ran to the door brushing up against the closet door. As God as my witness no one told me paint needed to dry. Mommy yelled at me. I turned around to see why she was yelling at me. Then she yelled some more. Daddy, carrying the bags, looked down at me and said "Oh Pocket." Along both of my flanks (I think I have flanks) was white paint. Also my whiskers were covered in paint. Oh my gosh I got painted by a door! Daddy said I looked like Colonel Sanders but I am a peace loving dog and don't want nothing to do with no war. He was all like, let's take a picture, let's take a picture but Mommy had already picked me up and began carrying me to the tub for the dreaded bath. And boy did she scrub. I don't think this was a let's get the dog clean scrub as much as a frustrated scrub. I hope you have never been the victim of a frustrated scrub. It's very aggressive. Mommy didn't get it all off. Which means Daddy got his picture but it's only of a little paint. While Foley agrees with my position she won't sue Mommy because she's a big wimp. Are there any other dog lawyers out there? Sigh. Well, take this as a lesson my friends, no matter if you paint a door or are painted by a door you're the one getting the sad smack of shame. Daddy put me down on his chair the last day of K9 Kamp. It was on a Thursday. It was a cool day and there was a heat wave coming. We had to complete the challenge today, present our Travelocity gnomes to Phil at the finish line, and find out what trip we had won. Daddy told me that this would be a simple challenge. We would get the flexy leash. We would then walk to the back of the Village of the Pruned where there is a cul-de-sac with four homes. Daddy picked that spot because there wasn't much traffic, a large circular area, and not many people to witness what could be another incident of K-9 Kamp Komedy. Koly suggested other activities we could do from previous camps. Daddy and I read them but the only one I was interested in was jumping the dime and some pups didn't feel that was much of a challenge but I swear according to the math, using my body size and weight, and Koly's, my dime is just as big as Koly's log. Come Thursday morning Daddy leashed me up. Foley barked and barked because these Kamp hijinks have become the high point of her week, but Daddy insisted it was just me and him. It was cold, for that one day, and the wind was blowing in my face. We were using the flexi leash which we never use but Daddy kept me on a short leash which I think is illegal and against the purpose of the flexi leash. We got to the circle and Daddy said that he was going to run and I had to catch him. I nodded. Daddy released the lock of the flexi leash and he began to run. And I ran right along side him. Daddy wanted me to jump on him and catch him but he never wanted me to do this before and I didn't know if this was a test. Then I saw something darting to my left which was bad because Daddy was on my right. I ran right in front of him. He tripped over me and stumbled forward but didn't fall down. I kept running after this object on my left and jerked Daddy to see the side when I reached the end of the leash.. But he still maintained his balance. And I saw that the object of my affection was a blowing piece of newspaper. Daddy looked at me with that look saying we were not getting the Travelocity Gnome. "You have to run straight Pocket, even if you don't catch me, we have to run straight." We ran to the other side of the circle and when we got to the end Daddy clapped his hands and I jumped on him and he said that counted for catching me. Oh boy! The trip to Arruba was within our grasp. Then something terrible happened. We ran in the other direction and a leaf blew across the road. I crossed in front Daddy again and he kicked me like a soccer ball. I yelped and rolled and Daddy stumbled and dropped to his knees and picked me up and let me lick his face. He told me I had to stop crossing in front of him. He tried running with me again but I wasn't feeling right from the kicking and rolling. He then picked me up and I trembled like I do when Foley and I are being left alone. He patted my head and told me that it was all right. We were done with K-9 Kamp for the year. But what about meeting Phil at the mat? The Travelocity Gnome. Is the dream over? Daddy carried me home. We sat down on the recliner together. We were both sleepy,. I told Daddy I was sorry I ruined K-9 Kamp and he told me he was proud of me because I am a little dog and did the best I could. I snuggled up to him. He told me it was nap time. I said we should do K-9 Knap Kamp. Daddy told me we would certainly be the K-9 Knap Kamp Khamp. Then we fell asleep together. Whenever we are blessed with a new life in our families it comes with a promise, not a guarantee, but a promise. A promise that we will be able to watch this little life grow, that we will have years of love from it, books of memories, countless smiles. But sometimes this promise is broken, and when it is it steals something from down in our soul. There was a lot of promise in Ruger Ru. 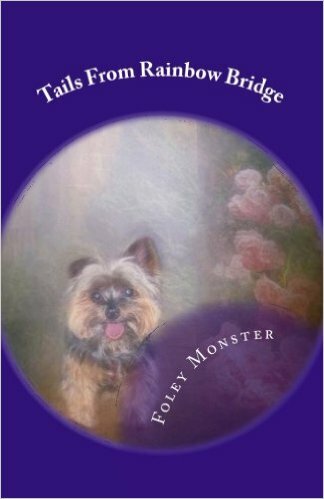 He marched into his forever home, shortly after Tanner Bub, a legendary dog, went to the Bridge. 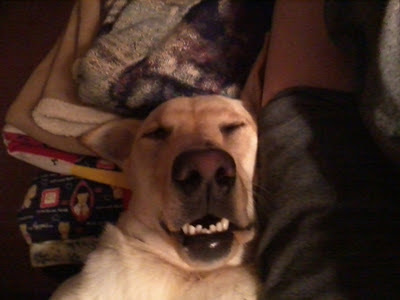 He was not brought in to replace Tanner Bub, no dog could. He was brought in to sprout new buds of love in his family's heart, and that goofy little puppy took to that job like a duck to water. 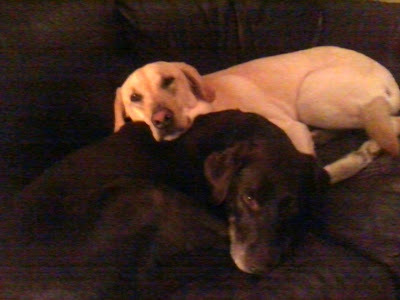 Ruger Ru was more than just the family dog and Cocoa's new brother, he was part of our family. We were there they day he arrived home and, through pictures and video, we all watched him grow up. We laughed about his antics the way we laugh about the way other people's children drive them mad. He would eat what he shouldn't eat. Sometimes a couch. Sometimes a bit of Mom. He certainly kept Foley Monster Attorney at Paw busy. Like most promises, when they are broken, no one saw it coming. Ruger was fine one day, a little sick the next, and gone the third. He had suffered a diaphragmatic hernia. It was, more than likely, something he was born with, and undetectable until the unthinkable happens. The diaphragm tears, and the stomach, liver and other internal organs press against the heart and lungs. Expensive emergency surgery needed to be done at a hospital four hours away and Ruger's chances were only 20% to survive. Because this was a birth defect chances were high it would happen again. Ruger may have survived, but the Ruger we knew, the happy, bouncing baby boy, there was little chance that pup would survive. So his parents made the hardest decision of all. And for the second time in less than three years they had to put down another beloved pet. His Mom found out that all the dogs in his litter had suffered similar fates. The diaphragmatic hernia is common in litters where the Mom has been over bred. Sadly there is never anyway for a Mom to know this. And sadly we come with no guarantees, just promises, and as we have learned as a group, whether it be by rescue, adoption, or purchase, there is no way to bring a pup into your heart that is less riskier than others. Some dogs like our beloved Doxie go to the bridge at 18, and others like Ruger go at two. It's why humans estimate our average life span at ten years. After my sister Blake died in 2001 Mommy and Daddy brought three dogs into our homes over seven years, all who died at less than four years of age. We don't know what happened with Jax the Pappilon. He got sick one day, and the doctor said he had a strained shoulder. He died the next day, at the age of three, not from a strained shoulder. Copper died in her crate one morning, her little heart gave out, at three and a half. And little Skye passed at less than a year, from something no one could diagnose. Promises broken, all. Each time Mommy and Daddy said never again. And each time they reached down in themselves and found a reason to believe that their next dog would fulfill the promise. So far Pocket has provided four years, a pretty good record for this vicinity. So Mommy knows the hell that Aunt Trudee is going through and she prayers that Aunt Trudee finds, when she is ready, the ability to open her heart again to a dog, because she is a great dog Mom, and there aren't many of those in the troubled world. So this is for our friend Ruger Ru, we miss you, we love you, and you will always been in our heart. There is nothing Pocket and I enjoy more than our walk through the Village of the Pruned to the mailboxes. We are so excited that there might be something for us. Most days we only find the same silly human missives. We aren't disappointed. Before we're back on the ramp we're excited about what the next day may bring. And then it happens. Daddy says "a package for Foley and Pocket." We drag him back home like we're champion dog sledders. Daddy dismisses the human missives and reads who our mail is from. He says it's from our brother Leo the Lion, Leo the Brave, Leo the Generous, and his wonderful Mom. There were two personally made Bauser bandannas and two personally made Bauser Halloween bandannas. There were also two tennis balls (which Pocket has already hidden behind or under something,) and four plush toys. What a haul! Leo you are truly a wonderful friend. And yes, we have pictures. These are two photos of me wearing my bandanna. I am being my cranky self so it was hard to get my picture because of my turning, and lying down, and being a diva. I hope they show off the bandannas properly. And of course I am perfect. Any problems should be blamed on the photographer. Nice going Daddy. 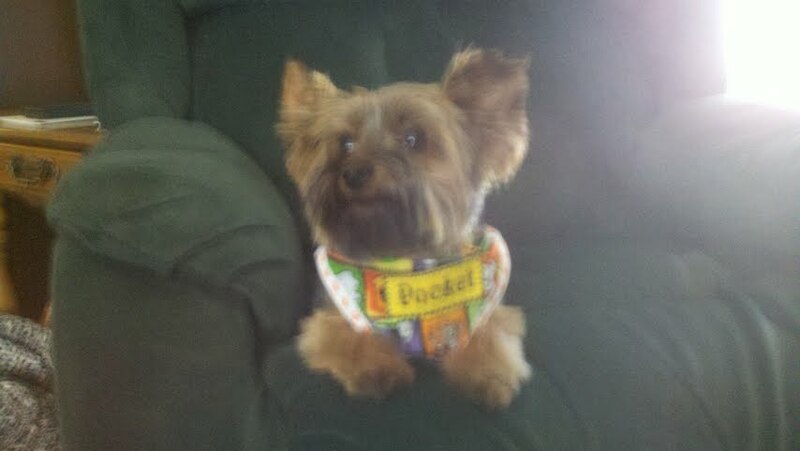 And here is the picture of Pocket with all the swag Leo sent us and you can see what a wonderful dog Leo is. One final time Leo, thank you. And I know what you are thinking. Thank you Foley for not posing with the swag so everyone could see it. No need to thank me Leo. You're the best. Love you. Chow. It took us a long time to begin this week’s challenge. First, Daddy needed days of therapy after last week’s challenge. Also the weather was hot and humid. After a steady rain last night it had finally cooled and we were ready to begin the next leg of K-9 Kamp. I was excited to hear about the jumping portion of this week’s challenge. I love jumping. But Daddy does not. It brought up bad memories. 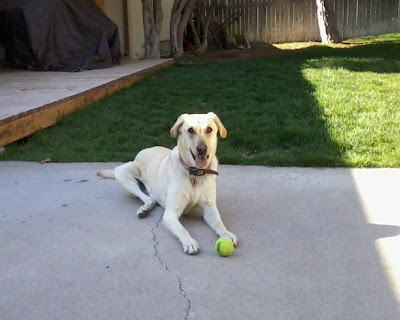 In this week’s instructional blog Koli gave us good news: Daddy did not have to jump rope. Koli said how great it has been for him to learn to exercise with his Mom. Except for the walking exercise Daddy and I haven’t done well with that, unless you count his stumbling, running, and carrying me a joint exercise. Daddy thought we were supposed to jump on a curb. But here in the Village of the Pruned we do not have curbs. They are the number one cause of Prune People falling and not getting up. So Daddy had a brainstorm (Daddy’s brainstorms are like summer showers with the sun out, it doesn’t produce much but it’s rather pleasant.) We would open the screen door and jump from the enclosed porch landing, over the threshold, and on to the kitchen floor. Daddy got my leash, took me outside to pee, he brought me back inside, gave me a treat, and I waited to be unleashed so I could go lie down, but I did not get unleashed. Daddy brought me back to the porch landing. “OK, Pocket, let’s jump!” he said as he jumped over the threshold into the house. And I watched. Daddy sighed. He told me to do it again. When he jumped I went in. And kept going pulling him forward to the treat jar, because I had been out again and was deserving. Daddy was frustrated. He went back to Koli’s blog. He realized that he should have picked something that was appropriate to my size to jump over. Koli, a large puggle jumped over a log. 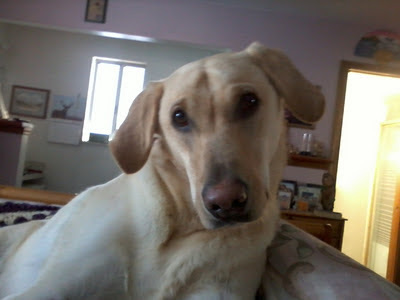 Daddy figured my height and weight, compared them with Koli, and found the equivalent jumping challenge for me: a dime. Oh we had fun. Up and over the dime. Back and forth. What a work out, and it only cost ten cents, ten cents people, order it now! Well we completed that challenge! Score one for us. Then we started on Stepping Out. We went back to the enclosed porch and this time Daddy stepped over the threshold and I watched. He tried to get me to step up. I wouldn’t, and when I did, I would walk forward. I got very confused. For months I would walk in a house and get unleashed then get a treat. But now I was walking in the house and then going back out like a stuttering mess. In Goodfellas Joe Pesci shot a guy for this type of thing. Daddy got a new toy Leo sent us that squeaked and I did a few up and downs because I wanted it but I lost interest. Daddy took the leash off since we were inside. He got some kibbles and fed them to me each time I stepped up, but when food becomes involved Foley gets involved and she kept getting in Daddy’s way trying to nibble the kibble. 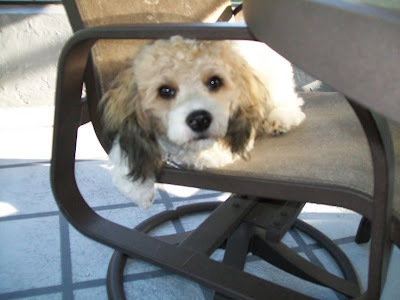 When Daddy ran out of kibble Foley and I went to the Lovekibble Seat and watched. He then leashed me up, we went outside, and we ran to the end of the street, and then Daddy began running back and I sat down with no amount of coaxing getting me to move. So I got carried back: quickly. As he did it he kept giving me instructions: Sit, down, stand. Heavens! Make up your mind. I did it a couple of times but did not want overdo it. That last thing I need is a Daddy with delusions of grandeur. 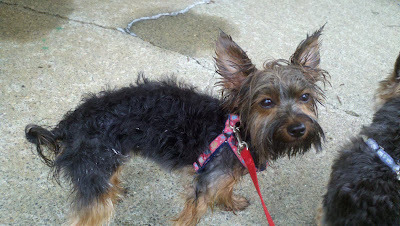 He then took me off the couch, leashed me, we went outside, and I ran with him to the end of the street. When we reached the end of the road Daddy stopped to tell me what a good job I had done, looked down the road, and saw, separated about six feet each, were my poo droppings. Hey, I’m not the one who fed me all the kibble. And he had not brought any poo picker uppers. We did finish the challenge by jumping over the dime again which was fun. I thought it was quite a good challenge for me, I got fed, I got to run, I relieved myself, and I made a dime. I hope everyone else had as successful a Kamp. I don’t like to admit how lucky I am. I would rather come on the Internet and complain about life. Saying how wonderful your life is doesn’t make for good blogging. So I tend to highlight what doesn’t go so well. But I am a lucky dog. For the last eleven years I have been able to live with my Mommy and Daddy. But it doesn’t work that way for all dogs. Sometimes, no matter how much they love each other, or, at least, loved one another, they can’t stay together any longer. My Daddy isn’t my Mommy’s first Daddy. Wait, that isn’t right. Humans relations always have me confused. Mommy had a Daddy before Daddy. Oh gosh I am confused. Who is Mommy’s Daddy? OK, there used to be a guy who slept with Mommy that wasn’t Daddy. Maybe a hundred. I don’t know. I am going to have to lie down soon. But as for me, one Daddy, one Mommy, living in wonderful co-dependent bliss. But for our pups of the week, Dulce and Ginger Dash, their Moms and Dads decided that life would be happier for everyone involved, including the pups, if they lived apart. This can be so hard on us pups. We like routine and when we move, or someone moves away, our routine becomes disrupted. But at the same time that little signal goes off in our minds, like the one that goes off in vampires minds on True Blood when someone who they drank from is in trouble, and we go into help because the reason we are on this rock is to be Mommy’s little helper. The signal to help overrides the loss of routine until we forget what the routine ever was. Even though all break ups are terribly painful for all involved Dulce’s Mom and Dad seem to be agreeing on going forward in the best way possible for everyone involved, including Dulce. He is going to spend time with both his Mom and Dad. Shared custody is hard enough to work out with kids, it is nice to see them working it out with their dog. Although it is very sad it so far seems like there won’t be a bloody war and Ducle will get to spend time with both parents. Ginger Dash’s parents split was not so amiable. Ginger suffered from one of the worst things: When Daddies go bad. He became mean and abusive to Ginger’s Mom. I know many of our Mommies have gone through the same horror, We are so concerned with abused dogs that we forget how many Moms here have been abused. Ginger Dash and and her Mom had to run to her Mom’s house for their on safety. 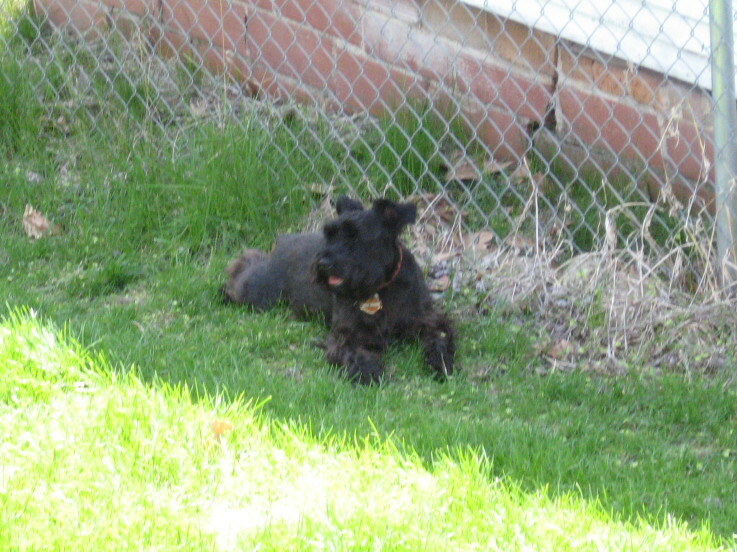 They had to leave behind Ginger’s siblings, Bit, Doodle, Scooby and Sam. Bit is Hattie’s sister Jackie Lynn’s birth Mom. Ginger Dash’s Mom, via our last communication with her, has not been able to convince Ginger’s Dad to give her the Ginger’s siblings. So far he has given her little cooperation. Ginger and her Mom are such special friends and we know they are going through a very difficult time. If she wants help to get her siblings back all Ginger has to do is ask us and we will raise a Brigade for her. I think Ginger is going to need to lean on us more than Dulce but we are going to be here for both of them. You both need to take care of your Mom, especially you Ginger. She has gone through some very hard times and there are lots of Mom here who have gone through the same thing. And we will pray for peace in the families of both Ginger and Dulce.